Calling himself "Mazdoor No 1", Prime Minister Narendra Modi on Tuesday launched the Pradhan Mantri Shram Yogi MaanDhan (PM-SYM), a pension scheme for workers in the unorganized sectors.The government claims that over 42 crore workers in the country will benefit from this scheme which will give a monthly pension of Rs 3,000 after the age 60 years.Announcing the national launch of the scheme at a public meeting in Vastral here, Modi said: "Till now over 14.5 lakh workers have been registered with this scheme. Over 42 crore workers in the unorganized sector will benefit from this scheme. "After independence, this is the first time such a scheme is being brought. Earlier nobody ever thought of the unorganized sector despite chanting slogans like 'Garibi Hatao' but it is your 'Mazdoor number 1' who has brought you this scheme," Modi declared.The beneficiaries will have to get themselves registered to the Common Service Centres in their areas.Anybody who is between 18 and 40 years and earning a salary of less than Rs 15,000 a month in unorganized sector can register. After registration, the beneficiaries will chose a specific amount between ranging between Rs 55 and Rs 200 which will have to be deposited in the scheme per month. An equal amount will be deposited by the central government.After reaching 60 years, the beneficiaries will start earning at least Rs 3,000 per month. "I have always said that dignity of labour should be practiced in our country as a culture. In all the central government institutions we have ensured 42 per cent rise in minimum wages. Earlier there were some schemes, but the middleman used to benefit. But now your 'Chaukidar' is alert, so the middleman's shops are being shut and so they are shouting 'Modi hatao'," the Prime Minister said. 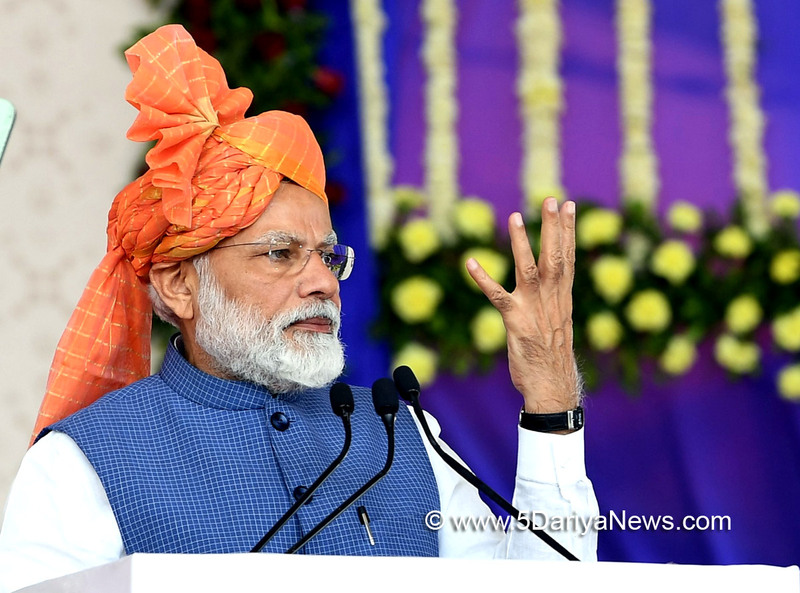 "Yeh Maha Milawat (Mega adulteration of opposition Alliance) are busy in striking out Modi while Modi is busy striking out terrorism," Modi told the enthusiastic crowd, referring to the air strikes on terror camps in Balakot in Pakistan.The Prime Minister has been in Ahmedabad since Monday for a series of inaugural and dedication programmes.Later, Modi attended religious ceremonies related to the world's first temple of Annapurna Mata, deity of Leuva Patel denomination of Patidars, at Adalaj near Gandhinagar, a day after he laid the foundation stone of the Rs 1,000 crore of Maa Temple Complex of Kadva Patels.